The Global Volcanism Program has no activity reports for Bobrof. The Global Volcanism Program has no Weekly Reports available for Bobrof. The Global Volcanism Program has no Bulletin Reports available for Bobrof. The Global Volcanism Program has no synonyms or subfeatures listed for Bobrof. The geology and timing of volcanism on this small uninhabited 3 x 4 km island, located in the Andreanof islands 50 km west of Adak and 15 km west of Kanaga volcano, are unknown (Coats, 1956). Apparent deposits of a massive submarine debris-avalanche deposit extend offshore to the NE. Smith et al. (1978) considered Bobrof to be of possible Holocene age. Andesitic pyroclastic-flow deposits are present on the 738-m-high volcano. Kay S M, Kay R W, Citron G P, 1982. Tectonic controls on tholeiitic and calc-alkaline magmatism in the Aleutian arc. J. Geophys. Res, 87: 4051-4072. The Global Volcanism Program is not aware of any Holocene eruptions from Bobrof. If this volcano has had large eruptions (VEI >= 4) prior to 10,000 years ago, information might be found on the Bobrof page in the LaMEVE (Large Magnitude Explosive Volcanic Eruptions) database, a part of the Volcano Global Risk Identification and Analysis Project (VOGRIPA). There is no Deformation History data available for Bobrof. There is no Emissions History data available for Bobrof. 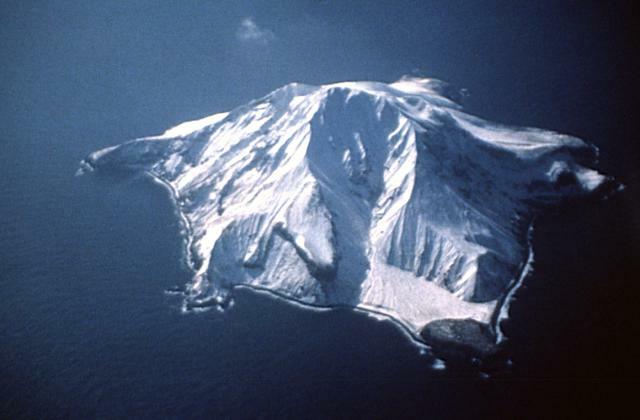 The small 3 x 4 km volcanic island of Bobrof lies 50 km west of Adak and 15 km west of Kanaga volcano. The irregular shoreline of the island has a half dozen small cliff-bound peninsulas. A deep valley (center) extends from the summit to the northern coast of the uninhabited island. The geology and timing of volcanism on Bobrof are unknown. Andesitic pyroclastic-flow deposits are present on the 738-m-high volcano. Photo courtesy of Alaska Volcano Observatory, U.S. Geological Survey. There are no samples for Bobrof in the Smithsonian's NMNH Department of Mineral Sciences Rock and Ore collection. Large Eruptions of Bobrof Information about large Quaternary eruptions (VEI >= 4) is cataloged in the Large Magnitude Explosive Volcanic Eruptions (LaMEVE) database of the Volcano Global Risk Identification and Analysis Project (VOGRIPA).